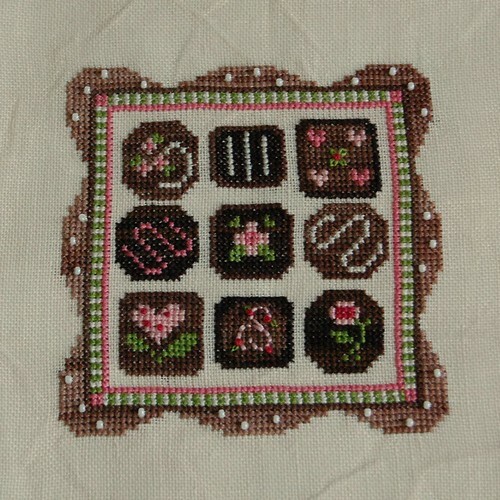 Nicole's Needlework: Chocolate Box Finished! I got it finished with a day to spare! Woo hoo! Now I have to go shopping for some "icing-like" trims. I'm going to check out Hancock fabrics. Hopefully I can find something cute there. 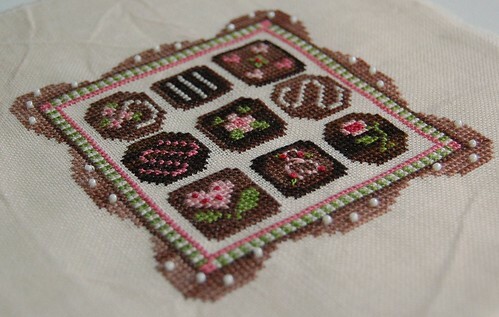 Little House Needleworks "Chocolate Box"
Wow, Nicole,this is absolutely beautiful! Knew you'd get it finished in time. Looks terrific! Looking forward to your finishing of it. Enjoy your day at Amy's tomorrow. That is so cute, Nicole. I can't wait to see your finished box! Have fun at Amy's! Your chocolates look absolutely delicious!! Wooohoooo! Congrats on the finish, just in the nick of time. Enjoy your stitching day tomorrow. Tell Amy I said hi! I wasn't crazy about this initially when it came out, but now that I have seen yours up close, it's so beautiful!! Great job. Your chocolate box turned out so cute! I love it! You must have stayed up all night to get it finished!! It is so pretty and I envy you getting to go to a finishing class! I think that sounds like fun! Have a great time and don't work too hard today! Wow, Nicole you are so fast! I can't wait to see it's finished with your wonderful skill! I wish I could come and stitch with you and Amy. That would be a dream come true! Thanx for letting me know which frame scroll those were. Have fun at the stitching meet up tomorrow. beautiful & a day to spare!!!! Oh, to have a day to stitch with friends!!!!!! ENJOY!!!!!!!!!!!!!!!! Chocolate Box looks wonderful! Can't wait to see it completely finished. Great job with the stitching! Can't wait to see the finished project. Have fun tomorrow! !